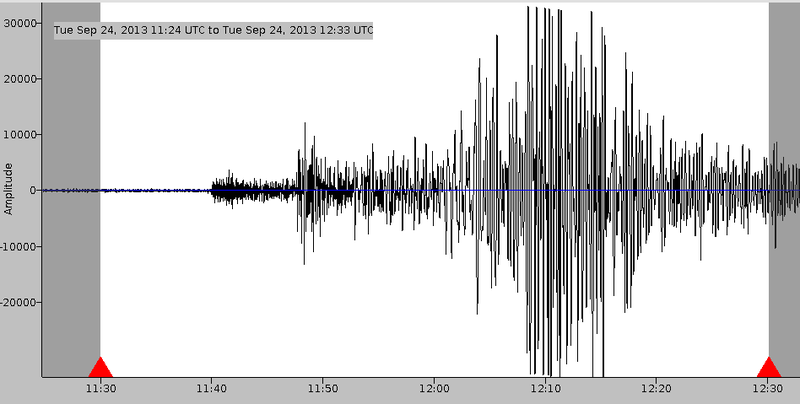 Today’s September 24, 2013 66km NNE of Awaran, Pakistan Earthquake M7.7 recorded at Keele, UK. 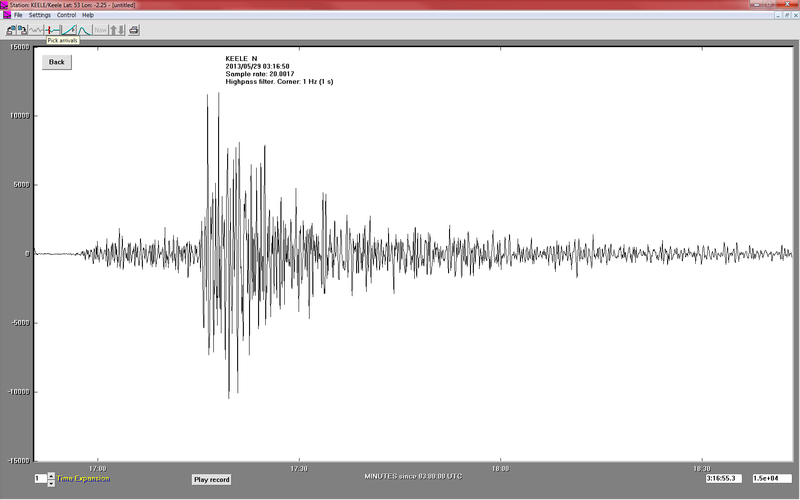 First impressions are that the event window could be a bit larger to see more detail in the seismogram. 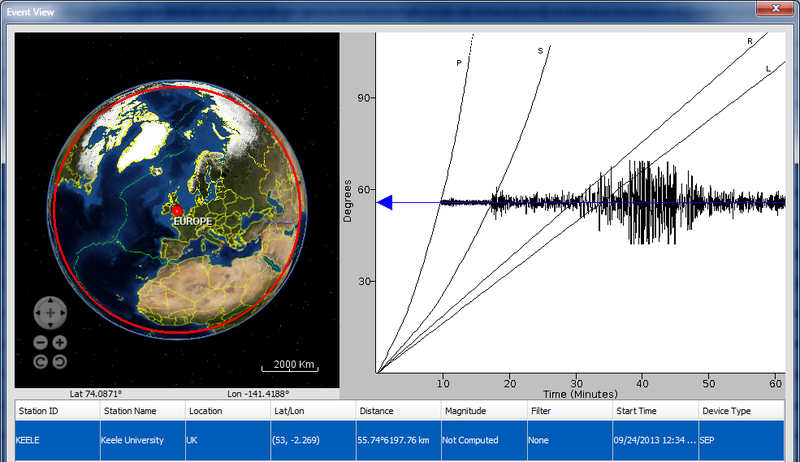 If you download jAmaseis from IRIS (www.iris.edu) you can now livestream Keele and other seismometers from around the world and pick and locate the events for yourself. 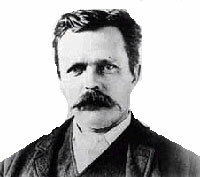 John Milne, the so called ‘father of modern seismology’ died 100 years ago today on July 31, 1913. There has been remarkably little fanfare (outside of the Isle of Wight) marking this centenary which is surprising for such a remarkable man. I can’t help thinking that if he had been a physicist or chemist (or even a palaeontologist or stratigrapher) there would be much more celebration. 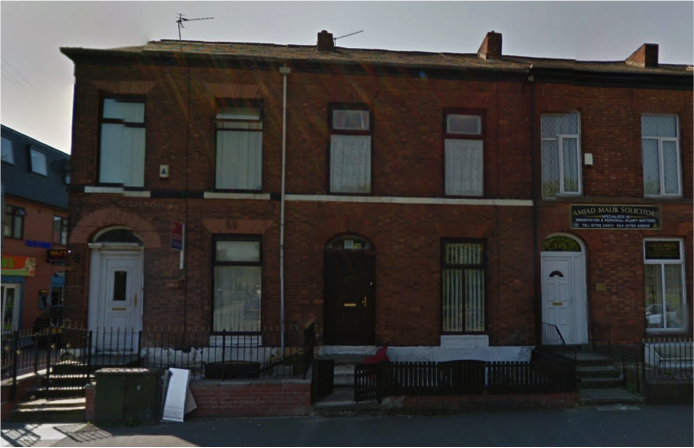 Milne was born Liverpool on December 30, 1850, in his grandmother’s house but he soon moved to the family home in Rochdale, 147 Drake Street which he considered home. The family later moved to Tunshill House on the outskirts of Rochdale, a building later demolished for the building of the M62 Motorway. He studied Applied Sciences at King’s College London then Geology at the Royal School of Mines (then in Jermyn Street, London) and at the University of Freiburg, Germany. His early geological career involved coal exploration in Newfoundland (he was asked on a Friday “can you go on Tuesday?”) and he was employed by Dr. Charles Tilstone Beke who was searching for Mount Sinai. Whilst Beke’s search was ill-conceived, Milne profitably used the opportunity to study the geology of the Sinai Peninsula. He then took up a three year post as Professor of Geology & Mining at Imperial College of Engineering Tokyo. He decided to travel to Japan from the UK overland. He largely travelled alone (because no one with sense would go with him) across Europe, Russia, Siberia, Mongolia & China by train, boat, horse & cart, camel, sled, and on foot – in winter! The journey of 13,000 km took 203 days (he was in no hurry) through the winter of 1875/6. He made geological notes all the way. On his first night in Tokyo felt an earthquake – triggering his life’s work in seismology. However, he was a polymath. He wrote a book on crystallography and being at a loss in the summers when not teaching, travelled Japan and the Kuril Islands studying its volcanoes, climbing over fifty of them. 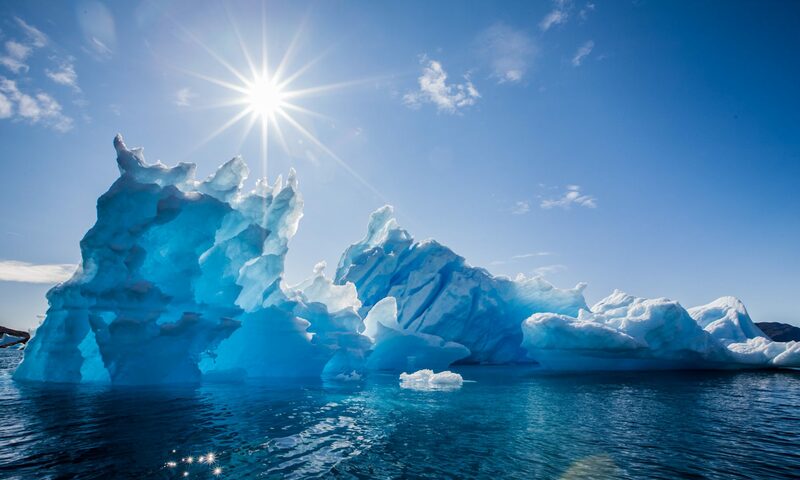 He is even credited in discovering a new volcano, Ebeko, in the Kuril Islands in 1878. What changed things for Milne was the large Tokyo-Yokohama earthquake in 1880. Milne noticed the direction of pendulums set swaying gave the direction towards earthquake. He sent out questionnaires across Japan requesting the exact time, damage, fall direction of chimneys etc., effectively initiating the first macroseismic survey. However the results were inconclusive and Milne realised that the way to understand earthquakes was by better instrumentation. He set up the Seismological Society of Japan in 1880, the first such society in the world. 15 pendulums were installed to record quake movements across Japan – by the time he left Japan there were almost 1000. He experimented with designs and created artificial earthquakes using explosives, once nearly getting killed by falling debris. With Thomas Gray (Professor of Telegraphic Engineering) he developed a three component seismograph recording on smoked paper (Gray-Milne seismograph) in 1881 and also pioneered the recording of electro-seismic phenomena, something that we are only returning to today. He researched and designed earthquake resistant buildings (including part of his house) with base isolation of the building on massive steel balls. In 1887 he was elected as a Fellow of the Royal Society. In 1889 with John MacDonald of the Tokyo Locomotive Department he invented a compact, robust and portable three-component vibration recorder. The Milne-MacDonald vibration recorder was originally for vibrations of steam locomotives and since it could pick-up excessive vibrations from poor sections of track, identifying and repairing these made for safer railways both in Japan and in Britain. He also influenced the BAAS (The British Association for the Advancement of Science) to set up the Seismological Investigation Committee in 1891 to investigate earthquake tremors that occurred in the British Isles. In 1893 he developed his horizontal pendulum seismometer, the first properly capable of recording distant earthquakes. It should be remembered that at this time ‘modern’ study of earthquakes was just in its infancy. It was only in 1893 that Bunjiro Koto, a Japanese geologist and seismologist, after the Nobi 1891 earthquake, asserted that earthquakes were caused by faults not damage resulting from them. In 1895 a fire destroyed his house, library and laboratory. He decided to leave Japan. He had married a Japanese girl, Tone, in 1881 but married her again at the British Consulate under British Law so that when he returned to the UK the marriage would be officially recognised. He arrived back in the UK in July 1895 and set up home and laboratory at Shide Hill House near Newport on the Isle of Wight. In 1896 a tsunami hit Japan and Milne investigated, writing a report on how the location of subsea faulting would affect global communications by cutting seabed cables. 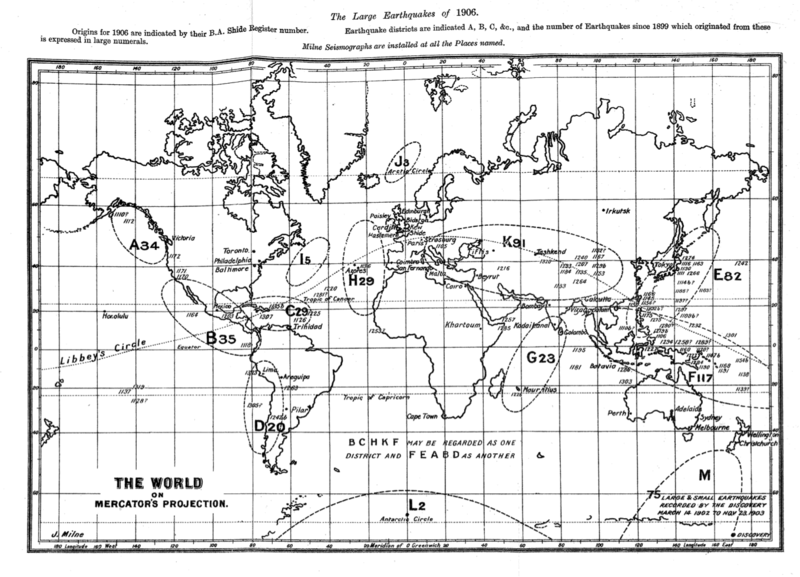 As a result, a global network of seismometers (Milne’s horizontal seismograph being the standard instrument) was set up, mainly in Commonwealth countries. Reports and seismograms came to Shide from all over the world and Milne painstakingly constructed earthquake catalogues “the Shide Circulars”. Milne made our railways safer, invented the macroseismic survey, the modern seismometer, the first world-wide seismic network, the first proper global earthquake catalogue, and initiated the study of British earthquakes – yet the only memorial to him in the mainland UK is a pub restaurant, part of a Premier Inn, close to the site of the former Tunshill House outside Rochdale. 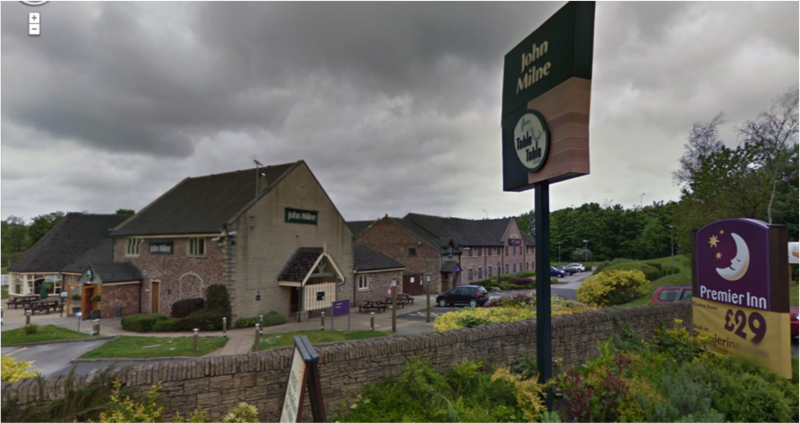 The John Milne Pub, Rochdale. Source: Google Streetview. including an exhibition at Carisbrooke Castle Museum. 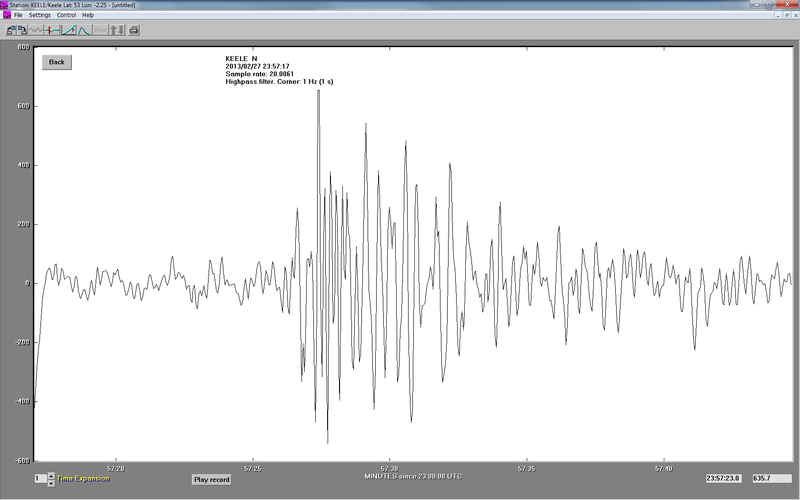 Lleyn Earthquake May 29, 2013 recorded at Keele. 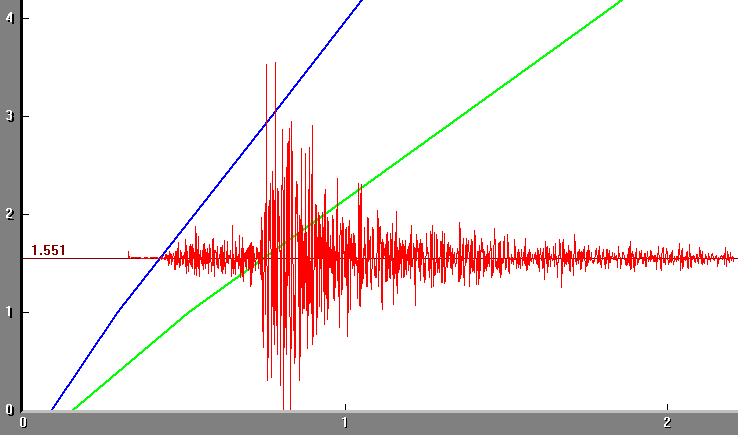 Small earthquake under the Lleyn Peninsula of North Wales early this morning (May 29, 2013) recorded here at Keele University. Magnitude 3.8. More details from the BBC here. The swarm of earthquakes in north Leicestershire / south Nottinghamshire continues with another magnitude 2.5 event, again recorded here at Keele. So far there have been several events in the sequence, a couple of previous ones recorded at Keele are in a previous post. Dr Ian G. Stimpson. 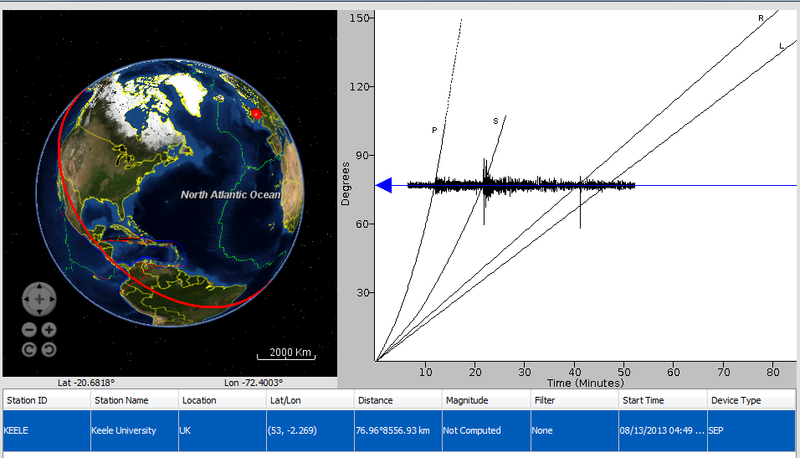 Seismologist, geophysicist and geologist at Keele University, U.K.
You can contact me at hypocentre [at] gmail [dot] com. All opinions are mine and do not necessarily represent those of my employer. This work by Dr Ian G. Stimpson is licensed under a Creative Commons Attribution-NonCommercial-ShareAlike 2.0 UK: England & Wales License.